Court is watching that videotaped statement now. Dennis is talking about his relationship with his father. Describes it as being "probably perfect," until he was a teenager. "We didn’t have that close father-son relationship," says Dennis. "He had this thing that you can’t be friends with your son...and I get that." #Oland trial adjourns for lunch. Back at 1:30 p.m.
Oland trial day #10 - afternoon session. In the witness box is SJ Police lead investigator in Richard Oland’s murder Stephen Davidson. 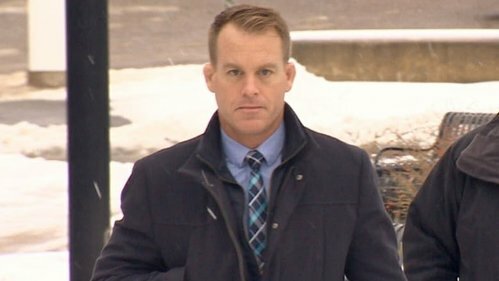 Davidson interviewed Dennis Oland the day his father’s body was discovered and court is continuing to view the tape of that session. 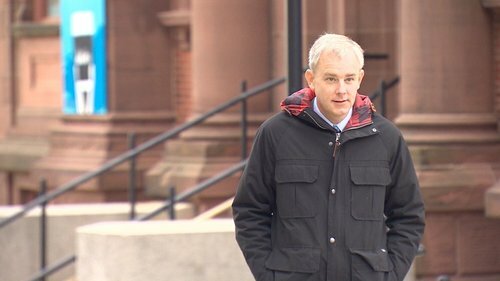 Before the lunch break, the court heard Dennis Oland say he had gone through a divorce 2 or 3 years prior to his statement. "I was very likely going to lose my home," which had been in the family for 70+ years, he said. Richard Oland "stepped up." As detailed by @BJMCBC Oland’s lawyers tried to have the interview tossed for this trial. Justice Terrence Morrison rejected the effort. Richard said, "That's not going to happen," Dennis recounted. "He basically bankrolled my whole divorce," which ended up costing $85 ,000, plus he had to give half his assets to his ex-wife, he said. "Basically I have a mortgage with him, which is an interest-only mortgage," about $1 ,600 a month. In addition to insights Dennis offers into his relationship with his father the interview catches Oland giving some incorrect information about meeting his father the previous day. Dennis is now describing to Const. Davidson going to visit his father at his office on July 6, 2011, around 5:30 p.m. He says he realized he had forgotten some stuff at his office, so he didn't actually make it into his father's 2nd-floor office at 52 Canterbury St. at first. He tells Davidson he was wearing a blue blazer the day of the murder although it later turns out he was wearing a brown sport coat that is found with traces of his father’s blood on it. He also tells of two trips to his father’s office the day of the murder instead of three. In the first trial Oland said he forgot about the third visit - the final time he saw his father alive - until days later. But it appeared from some questions posed by defence lawyers to witnesses in trial #1 they were unaware of a third visit until revealed during his testimony. About an hour into the interview, Davidson says, “Dennis, I have to ask you this: did you have any involvement in your father’s death?” "No," he replies. Davidson says he has to ask him that since he was the last known person to see him alive. "I have no reason to want my father dead, to kill him, to . . . I mean, no," says Dennis. "I mean, we’ve had our things, but no, I wouldn’t rob someone of the fun that they’re having and...You know I...He ’s just ...No." Davidson stepped out of the interview room for 8 min. Court fast-fowards the video. When Davidson goes back in, he apologies, tells Dennis some new information has come in. At 7:40 pm on the police interview tape Davidson asks Oland detailed questions of his coming and going from the office that day. At 7:43 - “What were you wearing?” Shirt, these pants and navy blazer Oland says without hesitation. Davidson says he wants to clarify a few things, including times, which are "very important." Tells Dennis there are surveillance cameras "all over the place," so he wants to "make sure the times line up." Now back to detailed minute by minute questions of movements arriving and leaving the office. No mention of a third visit. In trial #1 Oland said he forgot a family book he was supposed to bring to his mother and returned a third time, chatted with his father again and left. At 7:53 Davidson tells Oland (falsely) that his father’s office building had recently put in security cameras. Presumably he’s hoping Oland moves off his story but he does not react to the ruse. Defence contends it was an innocent mistake. He had been wearing a navy blazer earlier in the morning on the day he gave the statement. Point out police had already told Dennis they'd be checking security video. At 8:03 Davidson returns to detailed questions about the different visits to the office. What time, what route did you drive, where did you park, did you text anyone in between the visits when did you leave and on and on. For the first time at 8:07 Oland says he became “confused” and turned the wrong way up Princess St after leaving the office and pulled into a gravel parking lot (since paved). Davidson seizes on the new information. Oland is talking about the wrong way turn as though it occurs in between visit #1 and #2 . It actually occurs in between visit #2 and #3 and Oland gets out of the car and heads back into his father’s office one last time - something he withholds or forgets in this explanation. Davidson says it's "strange" Dennis didn't mention it before. "I don’t think it’s strange at all," he replies....“Is there something else that happened that you’re not telling me?” asks Davidson. Dennis says he's got him all confused now and he's getting a "mental block." Tape concludes. Court, because of scheduling problems caused by Sgt. Mark Smith’s illness, adjourns until next week. There's a knock at the door and Davidson steps out. Video ends. Veniot asks Davidson about the occasions he stepped out of the interview and left Dennis alone, whether he had any discussions with anyone? Yes. 1st time - Const. Keith Copeland and Const. Tony Gilbert, who were observing from the adjacent room, says Davidson. 2nd time, likely Copeland again. 3rd time, no conversations that he recalls. Trial adjourns until Tues at 9:30 a.m.